Thank you, I will...are you gray today? The shapes in this piece are lovely. What a truly stunning photograph. The black and white also really adds to this one--it gives you a chance to really focus on the patterns in the space of this scene. love the black and white! And your new thing up top (I forget what they are called) is an eye catcher!I hope you're enjoying these last days of summer! Love the abstract nature of this...the graphic simplicity and composition. Dvořák's Cello Concerto in b minor came to mind. Great photo. Perfect . Just a phrase, just a picture. Perfect. Love the simplicity the black and white processing gives this as well as the contrasts of lines and shapes. Fantastic image. Beautiful silhouette. Music is good for the soul. I really like the shapes in this photo. Great composition. What a beautiful, gentle image. oh how your pictures grab a soul and carry it. Swooning. Swooning. But no words. Just swooning. I love the shapes and lines in this. Great idea going black and white on this! Ah, musicograhper-- love the lines! A fascinating composition of shapes ... serene. Love this composition. B&W was a good choice. Beautiful image! I love the lines, the light, everything! beautiful! 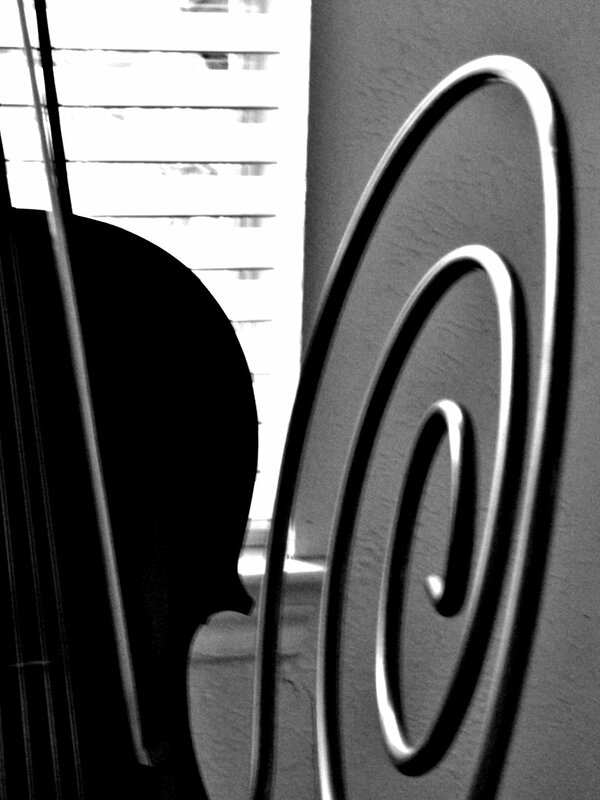 and i love the lines of the blinds and the strings on the cello. curvy and straight. just like life.